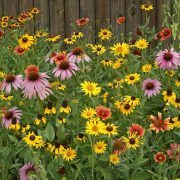 Applewood Seed Company’s wildflower seed mixtures are composed of adaptable, easy-to-grow species that are suitable for average soil and moisture conditions. Most mixes are composed of annual and perennial flower seeds. 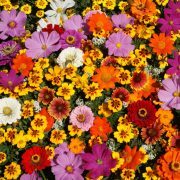 Annuals live for just one growing season and have been included to establish cover quickly and to give color the first year. The fast-growing annual plants act as a nurse crop to slower growing perennials. Nurse crops provide shelter and help to compete against weeds. Some annuals may reseed and produce new plants the following year (the biennials may also reseed). Perennials live for more than two years, and most perennials flower from the second year onward. Some mixtures are expressly created for dry, moist or shady conditions. 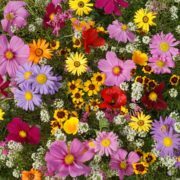 Regional wildflower mixtures such as the Midwest Mixture (MWMX) are formulated on the basis of climatic conditions (rainfall, temperature range, humidity) and elevation. Applewood mixtures are blended to give the widest possible range of colors and periods of bloom. Very few wildflowers bloom continually throughout the season; therefore, we have included spring-, summer-, and fall-blooming species in each mixture. 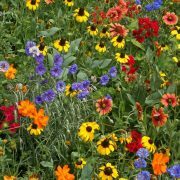 The types of wildflowers in our mixtures come in a wide range of colors such as blue, orange, pink, purple, red, white, and yellow. Mix heights vary from 10 inches to 8 feet. Our Knee-Hi Mixture (KHMX) is a very popular, special-use mix that grows less than 24 inches. Regional mixtures such as the Southeast Mix (SEMX) tend to have a wide variation of heights. Please refer to our individual species section for height, color and blooming period of each species. In general, our mixtures are formulated to contain approximately equal numbers of seeds of each species. This varies somewhat because of plant size, seed cost, aggressiveness and availability. For example, in the Monarch Butterfly Garden Mix, there are fewer seeds of Mexican Sunflower because the plants are very large. In our Shade Mix, we provide a lot more seed of Corn Poppy because it is not as competitive as other species in the mix. 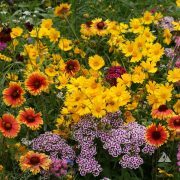 In addition, most mixtures are a balanced blend (by seed count) of perennial and annual flower seeds. Some mixtures such as the Annuals for Sun Mix (ASMX) are 100% annual and intended for growing just one season. Mixtures may vary occasionally from the indicated listing, based on availability of individual species. Since wildflower seeds are a crop, availability is dependent on the previous season’s production. In some years, production is good, and in other years it can be poor due to weather and other factors. Additionally, demand for seed can vary from year to year, and seeds may run out before the new production is available.